After years of text, still photos and slideshows as the main media in our international school projects, it is time to start learning the art of the moving image, ie. making short video clips. 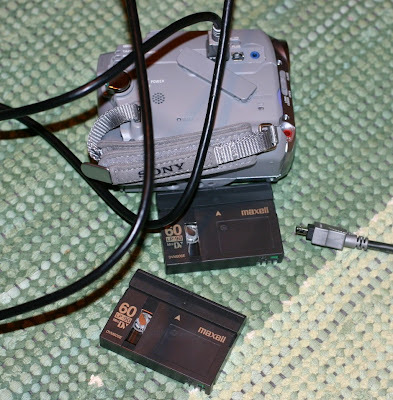 I have had a digital video camera for quite a few years, but have relied on others to do any editing required and to transfer the clips onto DVDs. For some reason, I have found the idea of learning this too daunting and time-consuming. There is no denying, though, that embedding a bit of video here and there does add a refreshing live touch to any project or presentation. This weekend I finally took the bull by the horns, equipped only with the simple Windows Movie Maker on my laptop. 'Capture from video device' was my first hurdle. No can do with the USB wire that came with the camera, I soon concluded after countless unsuccessful attempts! First lesson: you need a FIRE WIRE for this, advised my tech-savvy brother on the phone. So off to the supermarket. So far so good - got the unedited video captured as a draft on my laptop with no major upsets. Then editing clips, even importing pictures to put in between, making titles and credits. Even managed to add some clip transitions. I was getting rather carried away, and already hoping for more versatile features than the Movie Maker could provide. The final product is very rough, I'm afraid, but acceptable for a first try. Next problem - it sounds rather bland without any background music. So where to find Creative Commons or similar music that I am allowed to use if I credit it? Luckily my Finnish educator social network came to the rescue after I posted a question in their forum. Many members seemed to recommend a service called Jamendo. Lots and lots of amateur albums of all different genres there - most of them from France, to my surprise. Yet, slightly like a needle in a haystack finding anything suitable. In the end, I chose one piece, aptly called 'Around the world' for our project with schools from 10 different countries in Europe and Asia. With the bits of music in the background I could then save my piece, upload it on our Ning, and my first video was complete and online. Not even my daughter sniggering at it, saying that I sound like a maniac holding the poor students hostage in a horror movie, could diminish my pride! The project students in my school are in the process of scripting a short video about a day in our school to be shot, compiled and uploaded before our summer break in June. Although I'm sure some of the students are probably used to making videos, at least I can now give them tips about legal background music.